A note to the reader: This article requires following special instructions to watch the videos below. It's also recommended you be on a desktop computer, but if you are on a mobile device (which won't let you play two videos simultaneously), simply partner with a friend to play the second video. There is a long-standing urban legend claiming toilets situated in the Northern Hemisphere flush the draining water with a counter-clockwise rotation, while in the Southern Hemisphere it all spins down clockwise. 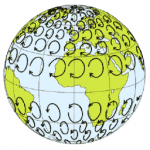 The Coriolis effect — a real observable effect described by physics — is said to be the culprit. However, if you have experimented with this observation in the past (yes, take a moment to go and check your toilet bowl now), you may have been disappointed to discover just the opposite. You might have tried a different drain and seen even a different rotation in the same house. Unfortunately, toilet bowls, sink drains and household bathtubs are too small in scale to allow the effects of the rotation of the Earth to be visible for everyday observation. In fact, if you were standing at the equator, you'd be moving over 1,000 miles per hour, and this rotation speed gets slower as you get closer to each of Earth's poles. It is this constant rotation, which you don't even notice, that provides a rotating reference frame for any object moving about the surface of the Earth. Since one full rotation takes 23 hours, 56 minutes, 4.0916 seconds (called a sidereal day, per the full rotation of a single spot at the Earth's surface, whereas the full 24 hour definition is based on the observation of the Sun returning to approximately the same location in the sky), the effect of this rotating frame of reference is quite small on most objects we might observe in our daily lives, like our flushing toilets. On the other hand, physical events on the scale of cyclones clearly demonstrate the clockwise vs counter-clockwise rotations depending on the hemisphere of the storm. Hurricanes might be incredible to watch on the news, but they are too frightening to experience directly. So, an at home physics experiment was conducted on each half of the world by Destin Sandlin from Smarter Every Day and Dr. Derek Muller from Veritasium, which were cleverly recorded for simultaneous viewing of the results. Now, here is where the important instructions come in: If you are on a desktop computer, click play in the lower video -- and pause it at exactly 25 seconds. Now, click play on the upper video (occurring in the Northern Hemisphere) and watch for the count down. At just the right moment, click play (again) in the lower video (occurring in the Southern Hemisphere) and watch both videos simultaneously. If you are on a mobile device, have a friend click play on the second video at the end of the countdown. You might also try expanding your desktop web browser to full screen mode (try hitting the key F11) to make sure you can see both clearly. The videos and music are synchronized, so if you don't think you have them rolling at the same time, reload this page and try again. It will be worth it. Discover the truth about toilets and see first hand what it really is like to live in a rotating frame of reference (since you probably didn't realize it before).